Disclosure: #Sponsored Although the owner of this blog received a product for review purposes, the opinions expressed are 100% the bloggers own. This post may contain affiliate links. Offers change or can be removed at any time without notice. Frugal-Shopping is not responsible for prize/product shipment. I used to work at a company that had one bathroom for about 12 people. It had no fan and let me tell you it was not pleasant for anyone to use. Even though people brought in aerosol sprays to try and mask the odors, the spray just mixed with the personal odors making it smell even worse. I sure wish Just a Drop was around then, it would have been a lot nicer to use. 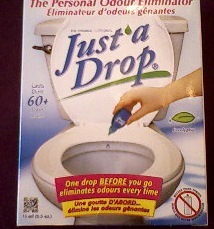 Just a Drop is an innovative eco-friendly way to eliminate personal bathroom odor. It is made from an extremely concentrated plant extract, disinfectant and fragrance. The formula is biodegradable, environmentally friendly and does not harm septic tanks or plumbing allowing you to use it at home, the office and while traveling. I got the Eucalyptus fragrance, which leaves a clean earthy and slight eucalyptus scent after you use it, not at all overbearing. You can sniff the bottle and it is not at all strong smelling either. You wouldn't think it could eliminate the odors very well but it does. It is so easy to use, just put 1-2 drops into the toilet BEFORE you go and 98% of the personal bathroom odors dissipate BEFORE they enter the air, leaving the bathroom odor free. 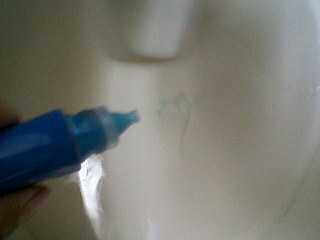 I put a drop in the toilet as an all natural air freshener whenever I am doing my hair or makeup in the bathroom. 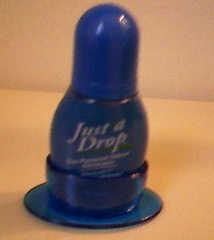 Just a Drop is portable enough to put in a pocket, briefcase and for a purse so I can use it anywhere I go. My package contained one 15ml bottle with holder and can last 60 or more days. Just a Drop is available in 7 fragrances: Eucalyptus, Refreshing Spring, Morning Rain, Citrus Splash, Lemon Fresh, Sunshiny Day and Floral Oasis. They also come in different sizes: sampler packs, on the go packets and more. This great product was featured on The Doctors TV Show and on The Dr. Oz show. Just a Drop believes you will love the product so much that they offer a 30 day unconditional money back guarantee. You won't find this product in stores, but you will find it on Amazon and the website. Visit Just a Drop to purchase, to learn more and to see all the other odor eliminating products they carry. Just a Drop is offering Frugal-Shopping readers a 20% discount with code: Blogger. Connect with them on Facebook and Twitter to hear about specials and promotions.